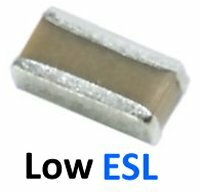 NIC Components is pleased to announce the addition of low equivalent series inductance (ESL) version products to its’ expanded offering of multilayer ceramic chip capacitors (MLCCs). New NMC-R series utilizes reverse geometry construction to reduce ESL by up to 60%, as compared to standard construction MLCCs. Offered in four case sizes, 0204, 0306, 0508 and 0612, the NMC-R series is ideal for use as high speed decoupling capacitors, mounted in close proximity or adjacent to microprocessors to minimize and suppress high frequency noise. Supported in X7R and X5R temperature coefficients, with capacitance value range of 10nF (0.01uF) to 1.0uF in tolerance of ±10% (K). Voltage ratings from 6.3V to 50V are supported over operating temperature ranges of -55°C to +125°C (X7R) and ]55°C to +85°C (X5R).